Aleksander L’vovich Gurilyov (born September 3 [August 22, O.S. ], 1803, Moscow – died September 11 [August 30, O.S. ], 1858, Moscow), Russian composer, pianist, violinist and teacher, is known as the author of wonderful lyrical romances. He was a semiprofessional composer, whose songs were very popular among the middle and upper layers of urban society. Aleksander Gurilyov was born into the family of a famous then composer Lev Stepanovich Gurilyov (1770–1844), who was Count Orlov’s serf and also a kapellmeister of his serf orchestra. Aleksander was immersed in a richly musical environment and received early training from his father (violin) and later took piano lessons from a famous Irish pianist and composer John Field and studied music theory with a composer Iosif Genishta. Aleksander Gurilyov played the violin and viola in the Count Orlov’s serf orchestra on his estate, Otrada, and at the house of Prince Golitsyn. In 1831 after their owner’s death, Aleksander and his father were emancipated. That year he moved to Moscow; there he established himself in the musical and literary sphere as a composer and teacher. A young musician composed a lot, gave lessons, and played concerts. Friendship with Varlamov was of great importance for Gurilyov, it liven up his lonely life. He composed brilliant piano variations based on Varlamov’s melody of the song Do Not Awaken Her at Dawn (Na zare ty yeyo ne budi). Gurilyov became acquainted with leading Moscow artists and writers of the day; he created romances based on the poems by N. Grekov, A. Kol’tsov and I. Makarov. His works quickly became very popular. Some of them – The Bell is Ringing Monotonously (Odnozvuchno gremit kolokol’chik), And Boring and Sad (I skuchno, i grustno), Justification (Opravdaniye), Winter evening (Zimniy vecher), You Cannot Understand (Vam ne poniat’), Parting (Razluka) – were published by M. Bernard in music magazines. Among all his songs the most recognizable are My Dear Mother (Matushka-golubushka), The Swallow Circles (V’yet’sya lastochka sizokrylaya) and The Little Bell (Kolokol’chik). A lot of Gurilyov’s songs and romances are based on dance rhythms of the mazurka, polka and waltz. The melody of the song A Tiny House (Domik-kroshechka) is in the nature of fervent playing a waltz. On the contrary, the melodies of the songs The Swallow Circles and The Little Bell characterized by the heartfelt intonations and a smooth rhythm of elegiac waltz. The Little Bell is a beautiful and haunting Russian folk song. Far and boundless road, a man traveling by coach hears the distant ringing of the type of bell that often was worn by horse. Smooth and thoughtful in the beginning, it reaches the end of a dramatic climax. The composer’s legacy consists of numerous romances, arrangement of Russian folk songs and piano pieces. 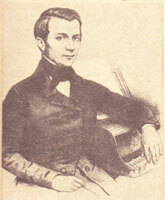 Gurilyov compiled a volume of 47 folksongs, Favorite Folk Songs (Izbrannye narodnye russkiye pyesni, 1849). However, despite finding friendship among creative types of the Moscow intelligentsia, and consistent compositional success, Gurilyov spent most of his life in poverty, teaching private lessons. Towards the end of his life, Gurilyov was stricken with severe paralysis and suffered from mental illness.